I can't believe a month has passed since I returned home from QuiltCon East which you all know took place in Savannah, GA. Since then I've been sick twice, first with a bad cold and then a nasty stomach virus. And I made a trip to Mississippi to attend the funeral of an uncle. I'm anticipating April to be a more healthy and happy month. While at QuiltCon, of course I shopped the vendors, but I was relatively good. I thought I would show you what I brought home. Most are purchases, but I scored an awesome souvenir! Now, just look at this pincushion. Do you see those initials AJN? You know whose they are, right? I was looking at the quilts late Thursday afternoon and ran into none other than Amanda Jean Nyberg of Crazy Mom Quilts. 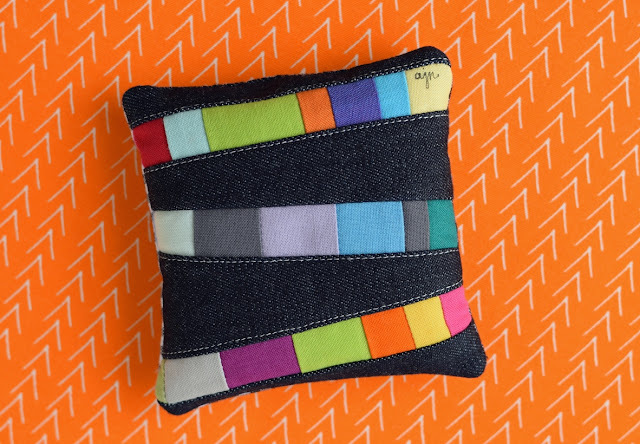 Before QuiltCon she mentioned in a blog post she would be giving out 75 pincushions at QuiltCon. You just had to show her a picture of a quilt you had made from one of her patterns. I've made a mini from her Trees pattern (blogged here). I've also made a mini Bright Birch Trees which haven't blogged about yet. Ok, on to the rest. I was excited to receive a fat quarter of Flourish from Seventy Six by Alison Glass in the QuiltCon swag bag. I splurged on a 2-year subscription to Simply Moderne and received this charm pack of Folk Art Revolution by Kathy Doughty and a tote bag and yearly calendar. 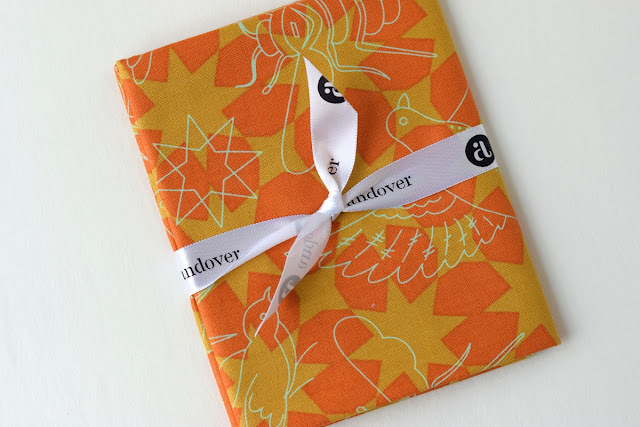 I also purchased a two small fat quarter bundles of Doe by Carolyn Friedlander at the Beyond the Reef booth. I don't remember from which booth, but I purchased four half-yard cuts of Cotton and Steel's Basic, Add It Up in Lip Gloss, Bananas, Sea Glass and Indigo. These have already been prewashed, cut into and added to the stash. The substrate of the three on the top are an unbleached quilting cotton which feels wonderful and keeps the colors from being too saturated if that makes sense. And lastly, I found these enamel and sterling silver earrings at the SCAD gift shop by Kathryn Riechert and thought they were the perfect souvenir since I took an indigo fabric dyeing class with Maura Ambrose of Folk Fibers. I'll share about my dyeing adventure in another post. I hope your brought home lots of goodies from QuiltCon! Linking the Sunday Stash #217 with Molli Sparkles. 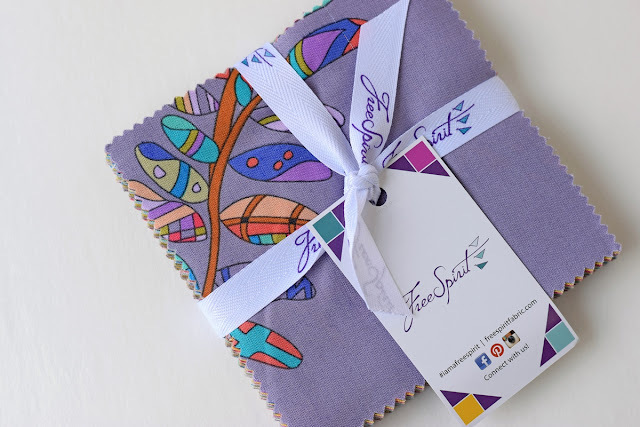 What wonderful goodies, those Free Spirit squares are so gorgeous. And earrings, it is so good to have a permanent reminder of that time away. I am so envious of your pincushion. It is a beauty. All of that fabric is beautiful. Not sure how you held back from bringing more home. Hope you have a very healthy April. Glad you're feeling better! I hope April is much better for you than March was. I'm sorry you've been sick since QuiltCon. I know several who were sick afterward, including one of the QuiltCon staff. It's a rough business being responsible for a quilt show! I hope for you that April is better. I had to look at my swag bag contents to find that I have the same Flourish print, but mine is blue... which explains why I didn't know I had it. I don't use much blue in my quilts. YOU received a color that I love! I bought less than you at QuiltCon, as I was looking for yardage of solids, and couldn't find any except Painter's Palette. Where was Robert Kaufman Kona?! 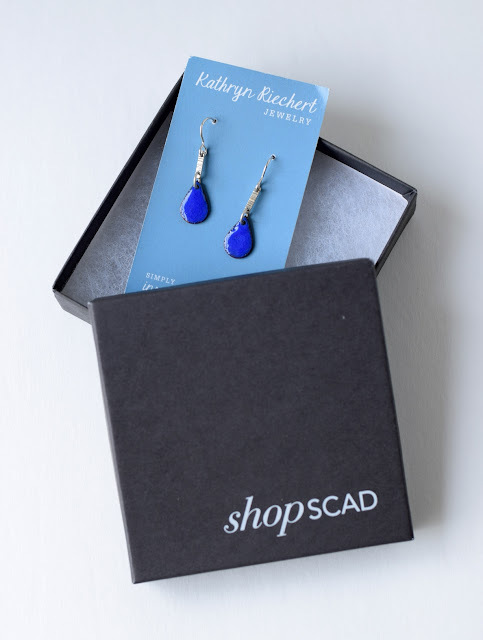 Your earrings are lovely, and the perfect keepsake for your SCAD workshop. I'm sure you'll enjoy wearing them. Hope you have a great week! 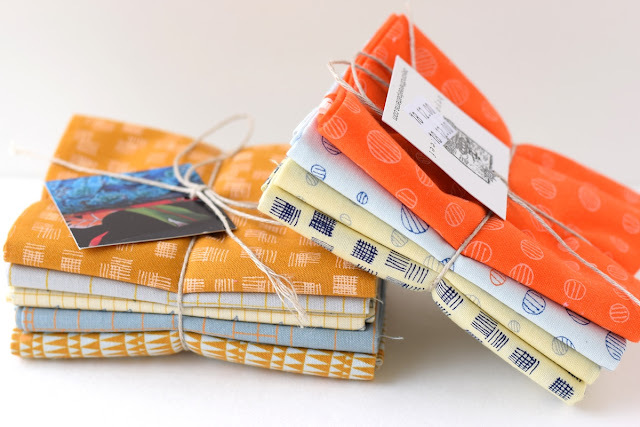 Ooo, very nice selection of quilty souvenirs! 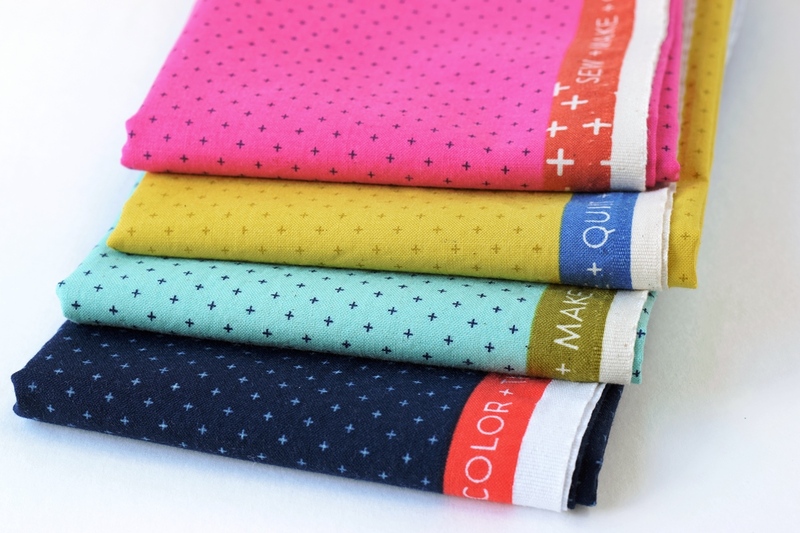 You'll have fun with all those beautiful new fabrics. I remember reading on AJN's blog - Crazy Mom Quilts about those pincushions that she was taking to the Quiltcon. You are a lucky gal to have received one from her. Wishing you health and happiness (with lots of creative moments) in the coming days. What a lovely bunch of fabrics! (And those earrings are yum!) I'm so sorry to hear you've been ill--it seems like it's traveling around my family too--but hopefully April will be absolutely lovely! Paige, I LOVE those blue earrings! I wish I had seen them, because I totally would have purchased some, lol! Hope you're feeling better now. Sorry to hear that you've been sick :-(. Lucky you to score that wonderful fabric and the pine cushion!